Niall Harrison: There are two reasons, initially, why I wanted to organize a discussion about Lavinia. One is that for all that I enjoyed it, I found myself in a similar position to Adam at the end of his review: “We might ask, in what ways is this book so very good? But the temptation would be to reply: in all the ways. There’s a quality to this fiction that I cannot capture in a review.” I’d like to try to pin down its strengths and weaknesses a bit more. But the other reason, and the main one if I’m honest, is that I’m very conscious that I’m a long way from being the book’s ideal reader. Once you get beyond a general, holistic picture of the book, there are at least two obvious ways of approaching it — as an Ursula Le Guin novel, or as a response to the Aeneid — that are closed to me, in that I haven’t read much Le Guin, and I haven’t read Virgil. What’s left, I find, is to approach Lavinia as a fantasy novel; but I can’t help feeling that I’m not responding to the heart of the book. How about the rest of you? Adam Roberts: I’m curious where everybody else stands on this, because of course it will have a bearing on how we react to Lavinia. So: Le Guin is one of the three most important SFF writers in my own relationship with genre. I’ve read everything she has written, some of it many times; and if I haven’t liked some of her more recent things (like the later Earthsea books or the rather stiff and, to me, unconvincing The Telling) this may have meant that I’ve fallen rather more hungrily on Lavinia precisely as a return to form. So: Vergil. My university education was English/Classics (I did a PhD on Browning and the Classics), and I’ve been pretty familiar with the Aeneid for a long time: I have, for instance, taught it to undergraduates. Knowing it as well as I do meant that my reading of Le Guin’s version was shadowed throughout by my sense of the original. Without that, I do wonder what I’d have made of it. Jo Coleman: I fall somewhere in the middle, as I’ve read (and loved) some of Le Guin, and bits of the Aeneid were wonderfully engraved into my mind at school but never got back to reading it fully. I’m quite interested to see that I may be the least enthusiastic of us. I certainly enjoyed it, particularly in parts, but I wouldn’t rave over it in the way that I would over some of Earthsea, for example. Nic Clarke: Le Guin: I’ve read quite a few of the novels — beginning with Earthsea, which was recommended to me by a school librarian when I was 13 or 14 — and three of her short fiction collections. I’ve always felt more at home with Le Guin than with most SF writers — I should probably note here that my genre preferences generally lie with fantasy, and always have — because the SFnal possibilities she’s interested in are the ones that interest me: different social and cultural configurations, and how the individual interacts with them. Social science rather than hard science. Virgil: I studied the Aeneid in A-Level Classics, and again as part of a Classics module I took as an undergrad. I adored it — definitely one of those texts that just gets more fascinating the closer you look at! — although for whatever reason I’ve never got round to reading either the Georgics or the Eclogues. Reading Lavinia gave me a whole new appreciation for just how good my A-Level teaching was — I was astonished by how much of the poem I remembered, given that it will be ten years this summer since I took that exam. Abigail Nussbaum: I think that within this group, my credentials are the least impressive. Like Niall, I haven’t read the Aeneid, but having grown up and been educated in a non-English speaking country I feel that I’m perhaps even farther away from it than he is, since my education placed a lesser emphasis on Western literature and its founding texts than it did on Hebrew literature (plus, having been in a math and science track in high school, I took only the very basic literature classes). 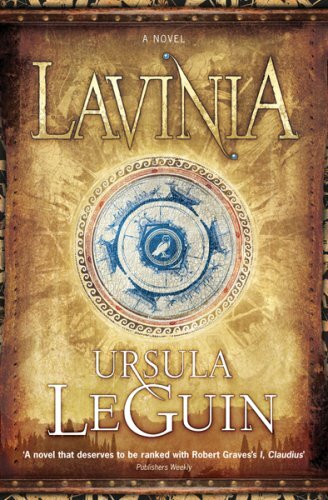 On the Le Guin front, Lavinia is only the second of her novels that I’ve managed to finish (the other is A Wizard of Earthsea, though I’ve never felt compelled to seek out its sequels). I bounced hard off Always Coming Home and The Left Hand of Darkness, though the latter, I think, has to do with having been too young when I picked it up, and I have enjoyed some of her short stories. I’ve been aware for a while that this a major gap in my reading, and Lavinia seemed like a good place to start a second attempt at Le Guin because of its excellent reception (Adam’s SH review was a major factor in my deciding to give the book a try) and because it seemed like a fairly simple, straightforward concept which I would either love or at least be able to get through quickly and easily. In the end, my response is somewhere between these two extremes. I enjoyed reading Lavinia very much — it’s beautifully written and an almost effortless read, which I was able to appreciate all the more because I came to it right after finishing a rather poorly written novel. But appreciating and enjoying the experience of reading a novel aren’t quite the same as loving it, and I can’t put my finger on one thing that Lavinia does or is trying to do that makes it particularly excellent. As Adam says, this is a book that’s easier to praise as a gestalt than it is for its parts. Niall Harrison: So can you pin down which elements of Lavinia you find yourself responding most strongly to — for better or worse? Jo Coleman: What I enjoyed was Le Guin’s portrayal of early Italian religion. I loved Lavinia’s visit to Albunea, and particularly that scene of the Ambarvalia, which seemed to typify that ability Le Guin has to, as Adam put it, make the magic feel natural. She never makes a big deal about it, and simply makes a quiet, clear assumption that people live according to magic, whether it be “fantasy” magic or magic of pre-Christianity. To me, it’s that quiet, clear assumption that brings the day to day rituals she describes to life, and makes them seem both absolutely normal and wonderful at the same time. She also deals very lightly with the values of Lavinia’s world — I love the way piety is explained, for example, or fas and nefas, what is the right and what, on the other hand, is against the right. I also agree with Adam, in his review, that Lavinia and Aeneas’ marriage is wonderfully portrayed. On the other hand, I thought the very existence of Lavinia was uncharacteristically heavy-handed. I’m looking forward to disagreement here, but I didn’t think Lavinia’s meditations on whether she existed or not were necessary. Such metaphysical ponderings seemed to me to clash with the grounded practicality with which Lavinia and her world are brought to life. They didn’t seem part of its values, with its deep piety and respect for ancestors. Admittedly I don’t know much about pre-Roman Italian philosophy, but I’m hesitant as to whether Lavinia would, as Le Guin has painted her, so self-respecting and so pious, be willing to accept without a fuss the fact that she was only a creation of a Poet and therefore exempt from normal life and death, remaining a shadowy fictional ghost. Which brings me to my second quibble, which is harder to pinpoint — and that is that despite the fact that Le Guin renders beautifully a pre-Roman Italian world, and that the battle scenes are certainly violent and tragic, it all felt to me a bit polished. Perhaps the polish is the quality of epic poetry which finds its way into the novel, or rather which Le Guin borrows, as I think she was certainly clear about exactly how she wanted her novel to be shaped by epic poetry and how she didn’t. But I’m not sure if I entirely believed in Lavinia’s world as a whole. Take the moment when she is telling us about her idyllic childhood exploring the hills with Silvia, who seems a bit like an early Italian Dicken with her tamed foxes and beribboned stag. This, Lavinia’s childhood, “the golden time of the first days when there was no fear in the world”. But is this a rendering of childhood, or a peculiarly idealized rendering of pre-Roman Italy? Is Ascanius’ shooting of the stag meant to symbolize its end? If so, it seems to me that Lavinia’s five years in the wood in her old age, surrounded by a herb garden and willing help and yet known as Mother Wolf because she shows no fear of the wilderness, seem a peculiarly cosy exile. Le Guin’s writing (or, what I’ve read) is often beautifully calm, often fable like, in its evocation of the relationship between man and nature. But in this instance I think the historical novel and the fable like lullaby of its telling are at odds. 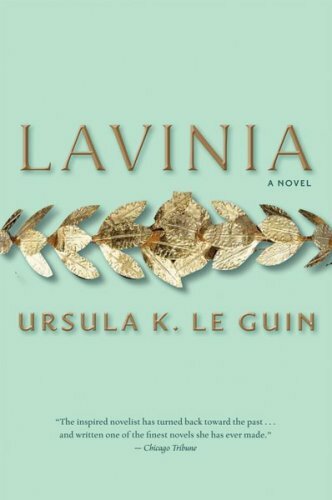 Nic Clarke: I think I read Lavinia primarily as an Aeneid fan, noting what was added, what was left out (several instances where the gods swoop in to save people, Iliad-style, which I guess we’ll discuss later), and what Le Guin did with certain scenes and themes. I also thought she mediated the poem’s transition between Odyssey and Iliad modes very well. My litmus test, I suppose, is the death of Turnus, which haunted the novel — very properly — even if Le Guin’s, or Lavinia’s, desire to idealise Aeneas perhaps dulls some of its sharper edges. Or at least the sharper edges I think it has. (As in Marion Zimmer Bradley’s The Firebrand, I was struck by the portrayal of Aeneas as the thinking woman’s Classical crumpet. But, again, that’s a topic for later!) Which is, I think, my verdict on the novel as a whole: for the most part, a wonderful reading experience, but there were just a few aspects that seemed to me to lack bite. I’m with Jo on the portrayal of pre-Roman religion and daily life, and I would broaden it to encompass the novel’s entire sense of place. The world was wonderfully lush and rich; I swear there were places where I could feel the sunshine radiating from the page. It is idealised, there’s no doubt, but I think this fits with the concerns of the poem — Virgil, too, is intensely interested in all things bucolic — and of our narrator. Niall Harrison: So perhaps I should try to talk a bit more about how and why Lavinia worked for me in as someone who hasn’t read the Aeneid, and also about the world of the book. Certainly, I was apprehensive before I started the book — I’m generally wary of retellings and riffs of this sort, because I often find they can be irritating, and result in works with little identity of their own. You might even say there’s something perverse about sitting down to read a novel when it’s explicitly dependent on an earlier work with which you are unfamiliar, and I couldn’t entirely disagree. Most of the time, Le Guin is vivifying a seamless, sacred, blessed time which may never have existed but which we all fervently long to believe in: the morning of the world, when the whole of nature was suffused with spirit, and people lived in reverence to it. The details of sacrifice and rite and oracle are lovingly described not for their own sake but because they reveal the deep sense of oneness with the world that supported and uplifted the ancients. And to which my response was: speak for yourself. Not only do I not believe in any such time, I do not fervently long to believe in it. Had Holland said “Le Guin manages to make us long for a time which may never have existed…” I’d have been fine with it; and, having read the book, I’d say that Le Guin actually does achieve something quite close to that. As Jo and Nic noted, the sense of closeness to nature, of the magic of nature, is full and almost overwhelming at times. There’s a very simple and attractive physicality to the book. But I didn’t know that originally, and what won me over to the book was Adam’s review, and Gary Wolfe’s, which emphasised precisely the narratorial games that Jo expressed reservations about. I do have some reservations of my own (which in a sense relate to the sense of polish Jo mentions), but I also think it’s a brilliant conceit. Most importantly to me, Lavinia’s self-awareness gives Le Guin an excuse to fill in all the context I felt I was missing in a completely non-annoying way. I really don’t think I can emphasize how impressed I was by that, given how sceptical I usually am of such devices. She won me over entirely. To me, the “We are all contingent” — which comes from Lavinia’s anxiety about her reality — and “I live in awe” — which speaks to the luminous world Le Guin is creating — are inextricably linked. The one reinforces the other. Similarly, I think the intrusion of Virgil allows Le Guin to very carefully control her reader’s response to the events of the book, in terms of what expectations it creates, which parts of the story it emphasizes, and so on — and I think that is one of the tricks that meant I, as someone who hadn’t read Virgil, felt at home in Lavinia. Interesting discussion guys but I must admit that it’s cemented the feeling that I would not get on with this particular book. I’m a Le Guin sceptic as I’ve never finished any her novels. The only other author in this category is Justina Robson but while I know exactly why I can’t stand Justina Robson, I’m not sure why I don’t get on with Le Guin, especially as she’s on the right side of one of my fantasy bug bears (kings and battles but no social history). Adam’s review initially put me off because I read it and got from it that A] Le Guin did something quite clever with a book I haven’t read (or know anything about) and B] Le Guin writes really well and is really good at world-building (in particular using an unusual but highly effective approach to ‘fantasising’ her setting). Of those two (or three really) qualities, the only interesting one is the fact that she writes well. Not something I would have disputed. I think that this discussion has put me off because Adam’s review has set the agenda and people seem to be writing about it on Adam’s terms. How many other discussions begin with people stating whether or not they’ve read some other book? The impression this gives is that you need to have at least read the Aeneid in order to get anything out of Lavinia and, ideally, you would have studied it in an academic context. I will say though that Adam’s review did give me the impression that it was a good book. Had I encountered Holland’s review first I would probably have taken away from it that not only is Lavinia not a book for me but that the world would probably be a better place if Le Guin stopped writing altogether. Except that I (tried to) go to some lengths to say exactly the opposite! In all fairness you did. You say that you got something out of it as someone who hadn’t read the Aeneid. But you also say that you’re not the book’s ideal reader and when you discuss what you liked about the book your praise is mostly in line with the second of the things I got out of Adam’s review. This gave me the impression that if you’re familiar with the Aeneid you get two things out of it. But if you’re not familiar with the Aeneid then you’re mostly going to be all about the world-building. I was overstating my position when I said that I got the impression that there’s nothing to be had in the book for non-Aeneid readers, but I stil get the impression that my enjoyment of the book would be hampered by my lack of interest in the classics. I’ve just finished Lavinia, and indeed I’ve sent a review off — a review which seems inadequate to me. So this discussion is apposite to me! I’m in Niall’s camp re the Aeneid — I know of it, I know I should have read it, but I haven’t. Still, I read Lavinia with the Aeneid, or my limited knowledge of hit, haunting the book. I do agree with Nic that Le Guin’s giving Lavinia her sort of shadowy continuing existence — in some sort of fictional character bardo, I suppose — seems close to a trick. It does pay some dividends, but I would say it doesn’t seem necessary. I thought the portrayal of earlier Italian religion — and lifestyle — very warm, very interesting. But note that Le Guin is careful to tell us in her afterword that it’s rather idealized. I certainly think there’s another dimension to the book if you know the Aeneid, and that it likely makes it a better book. I read Adam’s review, but it almost seems like he’s reading a different book to me – I’m reading an interesting historical novel about Italy with some supernatural elements, and while the discussions about how it uses the gods and ghosts differently to the poem and plays with narrative vs lyrical style are interesting to me, it’s not just an aspect of the book I missed, it’s an aspect that I would never have picked up on myself. I like this book quite a lot, primarily for the richness of the world, the quality of the writing, and for Lavinia herself, but it isn’t up there with the best of LeGuin for me. I have responded to the whole discussion here.